Overview: When setting up a new website, or moving sites from one server to another, it can be difficult to test and see what the site looks like before the DNS entries have propagated (or if your domain is not registered yet). DNS servers tell the world what the IP address the server that holds your site uses. When you visit a website, this DNS information is accessed. However, you can override the IP address that the DNS server provides by adding a different IP address to your “hosts” file on your local computer. Although this is the best method, there is an even simpler way at the bottom of this page, although some things on your site may not function. Step 2: Search for Notepad (don’t open it right away). 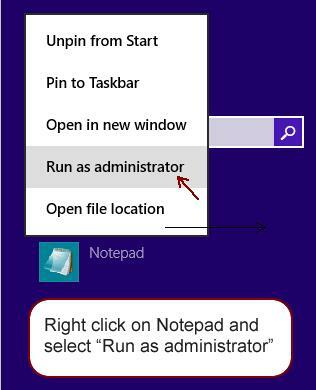 Right click on Notepad and select Run as administrator from menu. You will be prompted with a security warning to confirm you want to make changes. When you go to the etc folder, it appeared empty. 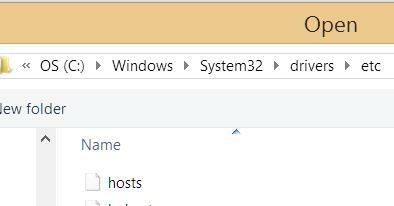 To select the hosts folder, you need to go to bottom right of the Open window and change selection from ‘Text Documents(*.txt) to All Files (*.*). Then just double click on the hosts file to open it. Step 4: Modify your hosts file to include your domain name and the IP address of new server on last line like this. Step 5: Save your file. When you type your domain name into a browser now, you will be looking at it at the new IP address. Remember to remove the IP from the hosts file once you’re DNS changes have completed. The Simpler way to check your hosts file is to use this website, but it is not as good as changing the hosts file locally on your computer.